Dynamic light scattering (DLS) is a technique in physics that can be used to determine the size distribution profile of small particles in suspension or polymers in solution. In the scope of DLS, temporal fluctuations are usually analyzed by means of the intensity or photon auto-correlation function (also known as photon correlation spectroscopy or quasi-elastic light scattering). In time domain analysis, the autocorrelation function (ACF) usually decays, starting from zero delay time, and faster dynamics due to smaller particles leads to faster decorrelation of the scattered intensity trace. It has been shown that the intensity of the ACF is the Fourier transformation of the power spectrum, and DLS measurements can therefore be equally well performed in the spectral domain. DLS can also be used to probe the behavior of complex fluids, such as concentrated polymer solutions. 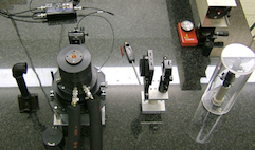 The DLS equipment consists of a diode laser (Coherent Verdi V5, λ= 532 nm, Pmax = 5W) and a goniometer with single-mode fiber detection optics (OZ from GMP, Zürich, Switzerland). The data is acquired by an ALV/SO-SIPD/DUAL photomultiplier with pseudo-cross correlation and an ALV 5000/E correlator with fast expansion (ALV, Langen, Germany) which allows a minimum time interval of 12.5 ns for the correlation function. The ALV/5000E software package is used to record and store the correlation functions. 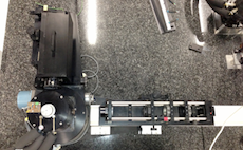 The DLS equipment consists of a Helium-Neon-Laser (Spectra Physics, P=25mW, λ=632.8nm) and a goniometer with few-mode fiber detection optics (ALV, Langen, Germany). The data is acquired by a Perkin Elmer precise Photon Counting Module (Perkin Elmer, Voudreuil, Canada) and an ALV 7004 Digital Multiple Tau Real Time Correlator (ALV, Langen, Germany), which allows a minimum time interval of 25 ns for the correlation function. The ALV/5000E software package is used to record and store the correlation functions. The Multispeckle DLS consists of a GLG5360 Helium-Neon Laser (NEC Corporation, Tokyo, Japan, P=10mW, λ=632.8nm) and a goniometer with single-mode fiber detection optics (OZ from GMP, Zürich, Switzerland). The data for correlation times up to seconds is acquired by an ALV/SO-SIPD/DUAL photomultiplier with pseudo-cross correlation and an ALV 5000/E correlator with fast expansion (ALV, Langen, Germany), which allows a minimum time interval of 12.5 ns for the correlation function. The ALV/5000E software package is used to record and store the correlation functions. The sample can be automatically shifted vertically in order to obtain the ensemble averaged short time correlation function for non-ergodic samples in a brute force approach. The second detector, a CCD camera (Sony DMK 21BU04) with a resolution of 640 x 480 pixels and a pixel size of 5.6 x 5.6 μm, can be used for recording multiple speckles and correlation times up to 104s. The flat sample cell has a variable thickness from 500 μm down to 10 μm to avoid multiple scattering.